Native Dog has set out to transcend the hunting, sporting and household marketplace. We are further trying to separate ourselves from the competition by offering a wide range of communications, tactical/survival gear, and truck/ATV accessories. Click here to check out our dog tracking equipment and accessories, specialized hunting gear, training equipment, and communication options. Click here for leashes, leads and collars as well as toys, treats, and everyday pet accessories. Check out winches, bumpers, LED light bars, dog boxes, and more for your truck, ATV, or golf cart. All the cool stuff you never knew you needed. EDC, decals, coolers, apparel, and more. Hunting Supplies, Dog Supplies, Truck Accessories, and more! 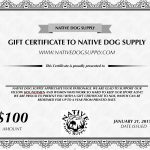 Welcome to Native Dog Supply–you’re one stop shop for dog hunting supplies, sporting supplies, every day dog products, and more. Whether you’re a hunter, trainer, competitor, or just a dog lover, you’ll find what you need at the prices you want. 13910 SE 47th Street Rd. To start shopping, select a category below.